Arabia Petraea and Part of Egypt including the Delta. Germania Magna with the Provinces on the Upper Danube. This is an unusual 1867 map by William Hughes featuring Egypt and Germany in antiquity. 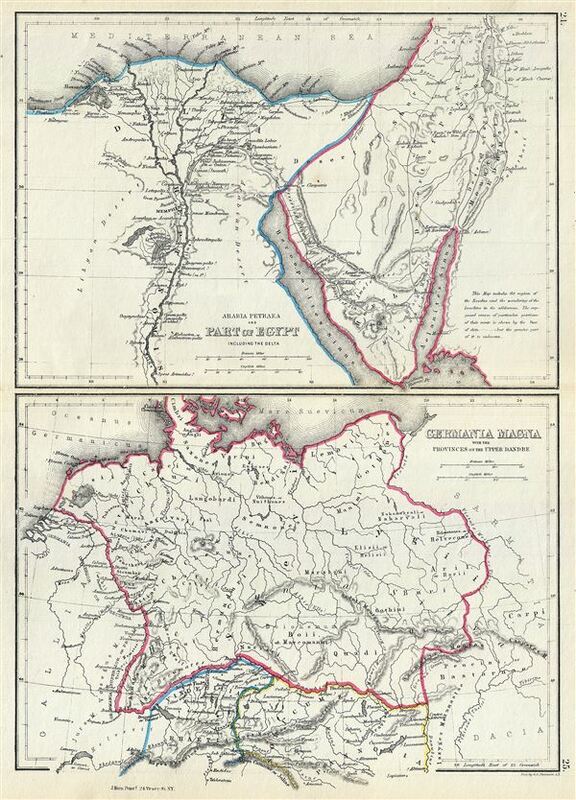 Essentially two maps on a single sheet, the top map focuses on Egypt, including the Sinai Peninsula. This map, centered on the Nile Valley, identifies the sites of ancient towns, villages, pyramids (including the Pyramids near Memphis) and lakes. It features both ancient and contemporary place names for each destination - an invaluable resource for scholars of antiquity. The map depicts the supposed course of the wandering of the Israelites following the Exodus, as they fled out of Egypt, across the Red Sea, and subsequently spent the next forty years wandering in the Sinai before migrating into the Promised Land by crossing the Jordan River just north of the Dead Sea. Possibly this map's most interesting aspect is its presentation of the ancient Lake Moeris, now just a small lake called Birket Qarun, and the legendary 'Labyrinth' near modern day Hawara. The lost Labyrinth was described by many classical authors including Herodotus, Strabo, Diodorus and Pliny. A sprawling megalithic complex designed by Imandes for the Pharoh Amenemhet III, the Labyrinth is believed to have contained thousands of rooms filled with hieroglyphs and ancient Egyptian sculptures. Several archeological surveys have been undertaken to unearth the labyrinth, but so far no findings have been confirmed. The lower map features ancient Germany. The map covers the lands of the Germanic peoples prior to the fall of the Roman Empire from modern day Denmark to Switzerland and from Belgium to Poland. This particular map focuses on the regions of Germania Magna (Greater Germany) which resisted all attempts at Roman rule. At the time, 'Germania' was a name given to the lands between the Alps and the Baltic Sea. The region was inhabited mainly by Germanic, but also Celtic, Baltic, Scythian, proto-Slavic peoples. This map identifies many of the old tribes, including the Quadi, Marcomanni, Suevi, Angli, Saxones, Chatti (Hessians), and several others. Caesar Augustus described the Germanic tribesmen north of the Roman Empire as extremely savage and a threat to Roman Gaul. His Roman Legions, led by Generals Germanicus and Tiberius, conquered Germania Magna to the River Elbe, and occupied it until the Romans were defeated at the Battle of the Teutoburg Forest, in 9AD. The Romans withdrew, establishing the Rhine and the Danube Rivers as Germanic boundary of the Roman Empire. This map was created by William Hughes, printed by J. Bien and engraved by G.E. Sherman, for issued as plates 24 and 25 in Sheldon and Company's An Atlas of Classical Geography.